It’s been seen on the faces of everyone from Hollywood actresses, reality TV stars to celebrity make-up artists, STARSKIN® is the beauty brand on everyone’s lips, or faces if you will, and is set to be the biggest beauty news to hit the UAE this year. Founded by Paul Hendriks and Nicole Arnoldussen, using the most advanced technology in skincare alongside luxury active ingredients, STARSKIN®’s sheet masks have enjoyed astounding success, especially in the Middle East and Europe. We caught up with Nicole Arnoldussen, co-founder of STARSKIN® to learn just what it is that has made these products the beauty buys du jour. So if you’ve ever wondered what the secret was to celebrity perfect skin, read on! What was your inspiration for STARSKIN? STARSKIN was born from a passion to make glowing celebrity complexions attainable without a team of beauty and makeup experts. On our travels, Paul and myself spent years studying beauty trends and chose from the most innovative and exclusive beauty technologies and formulas to develop STARSKIN’s range of at-home skincare and beauty products. We were particularly fascinated by Korean people’s – both men and women – obsession to their skincare regime and advancements in skincare innovation, and consulted with dermatologists and skincare experts to produce and launch a series of high quality, premium skincare products to bring Korean skincare innovations to Europe, Middle East and the rest of the world. All to give your skin the star treatment it deserves! STARSKIN’s range of Bio-Cellulose Second Skin Face Masks, its Glowstar™ Foaming Peeling Perfection Puff and the Dual-Layer Hand and Foot Masks are so well-received in Europe and the Middle East that within three months of launch, our products were sold in over 1,500 stores in more than 25 countries! What differentiates STARSKIN from other beauty brands? And indeed, other home face masks? What differentiates us has to be our brand story and our high quality and highly effective products to make radiant Hollywood worthy complexions attainable in the comfort of your own home. While celebrities may have an arsenal of beauty experts at their disposal to get camera-ready, what we’ve learned from top experts is that with the right products, Hollywood-worthy results are completely within reach. Our collection of pampering Bio-Cellulose Second Skin masks and our well-loved Glowstar™ Foaming Peeling Perfection puff deliver the results of an expert facial in just 20 minutes. Cutting-edge professional Double-Layer Technology body masks leave the body silky, toned and youthful-looking from head to toe. All this, together with our passion for premium, high-quality and natural ingredients, ensure that with STARSKIN®, the previously unattainable glamour of movie star skin is now at your fingertips. Now, that is STARSKIN! Can we expect other products in the STARSKIN range? And if so, what will they be and when? Following the successful launch of our VIP Luxury Gold and Diamond Bio-Cellulose Second Skin Face Masks in the UAE in February, I’m so pleased to share that STARSKIN will be unveiling some very exciting skincare and beauty innovations in coming months. Stay tuned! Does STARSKIN have a celebrity following? Yes, we do! J We are seeing that more and more celebrities, international models, celebrity makeup artists and influencers are discovering our products, and we are delighted that they love STARSKIN! In last years and the recent fashion weeks, many top models have used our masks to prep their faces before hitting the runway. Celebrity beauty blogger Huda Kattan has tried our VIP Luxury masks and she liked it! But STARSKIN was created from a passion to make radiant, celebrity complexions within reach for women (and men ) around the world, so our products are made for everyone to enjoy professional results, in the comfort of your own home. What ingredients do STARSKIN masks combine and what makes these unique to the brand? First of all, it’s what’s in our Bio-Cellulose masks itself that makes our masks so effective! STARSKIN® masks are made of the highest quality Bio-Cellulose, derived from organic, vitamin-rich coconut juice which has been naturally fermented to create ultra-fine microfibers, this innovative bio-material adheres to the face like a second skin, quickly and efficiently “force-feeding” a concentrated dose of essential skincare ingredients into the skin without irritation. Cocos Nucifera (Coconut) Fruit Extract makes a regular appearance in all our face and eye masks for its moisturizing effects and helping to prevent water loss. Coconut extract helps diminish the appearance of acne scars and prevent new acne scars from forming. It’s antibacterial, antifungal, antioxidant and antimicrobial properties that help soothe inflammation, fight acne infections and palliates that can cause acne. It also promotes healthy cell growth and supports good circulation. Probiotics in skincare is really hot right now and its benefits have been proven to go beyond the digestive tract to benefit the skin. Lactobacillus is one of our star ingredients that appear in all but one of our masks. It’s anti-ageing properties include soothing, restoration of skin elasticity, and enhanced collagen synthesis, and it also helps to prevent the development of fine lines and wrinkles. It is anti-inflammatory and anti-bacterial, and helps reduce inflammatory skin disorders such as acne and eczema. Fermentation Poised to become the next big beauty trend from Asia, fermented skincare ingredients are enriched in potent peptides, proteins, antioxidants and amino acids, and can help to hydrate, improve skin tone and visibly reduce fine lines and rough texture. Our Bio-Cellulose masks are made from fermented coconut juice, and the generous amount of serum they are soaked in (30ml!) contain active that have been fermented to maximize the effects of your mask treatment. Another ingredient that is truly a skin-saver is Niacinamide – a wonderful cell-communicating ingredient that offers multiple benefits for ageing skin. It improves skin elasticity, dramatically enhances its barrier function, helps erase discolorations, and revives a healthy skin tone and texture. This is an excellent ingredient for those struggling with wrinkles and breakouts. How should STARSKIN masks be used? We recommend to use our masks 1-2 times a week, depending on your skin’s needs. Mask treatments are necessary for deep nourishment; they promise instant and brilliant results with multiple skin-boosting effects and nutrients, giving a hydration boost, glowing skin and an overall, brighter appearance. Not to mention that it’s a great excuse to pamper yourself and enjoy a de-stressing treatment that can moisturize, detoxify, replenish nutrients and promote circulation. Has your background always been in the beauty industry? Yes. I worked many years for Chanel and later for several high-end beauty retailers in Europe. My passion has always been to understand the needs of the beauty consumers and to track the newest beauty trends to help them with their needs. Now with our own brand I can really cater to the exact needs of the consumer. Why do you think STARSKIN has enjoyed such immediate success in the Middle East market? In the UAE, consumers are increasingly on the lookout for personalized solutions that tackle specific skin concerns or which can offer specific, improved benefits, such as beauty treatments that fit seamlessly with their fast-paced lifestyle without compromising on quality and results. I think STARSKIN® is the timely response to consumers’ demands for highly effective skincare solutions that are convenient and easy to use. Our premium and all-natural Bio-Cellulose Second Skin Face Masks are made in Korea, and are formulated with a carefully curated list of essential skincare ingredients to create a luxurious experience for our consumers who also place a high value on efficacy and the ingredients list. Tell us about the new VIP masks and why these are different? Our newly launched VIP Luxury Bio-Cellulose Gold and Diamond Masks are truly luxurious and special. The Gold Mask™ contains pure colloidal gold which helps diminishes the appearance of fine lines, wrinkles and sun damage. Natural leaf extracts enhance the miraculous skin-rejuvenating effects; smoothens wrinkles and brightens the skin. In just 15-20 minutes The Gold Mask™ will leave your skin replenished, rehydrated and visibly plumper with an opulent, star-like glow. The Diamond Mask™ contains ultra-fine diamond dust to illuminate your complexion from within. Exquisite emerald and tourmaline extracts re-energize the skin; antioxidant-rich White Mulberry Bark perfects your skin tone. While most masks have a high water content – you can see this from looking at its order of appearance from the ingredients list, our Gold and Diamond masks are soaked in a rich, creamy serum based on Evening Primrose extract instead of water, which is deeply nourishing and leaves your skin dramatically softer.How it works is this: Evening primrose extract is high in essential fatty acids and helps to make your skin feel softer and smoother with more elasticity and less wrinkles. It’s also good for discoloration, acne and eczema prone skin and balances hormonal issues. Our lists of luxury ingredients include the finest active ingredients such as natural leaf extracts with its miraculous skin-rejuvenating effects, and antioxidant-rich White Mulberry Bark to help perfect your skin tone. In just 15-20 minutes The Gold Mask™ and The Diamond Mask™ will leave your skin brighter, flawless-looking and crystal-clear with a luminous, star-like glow. The ultimate star treatment at home! What’s your one beauty tip that you wish to share with our readers? Well, the secret to achieving glowing, red-carpet ready complexions lies in using quality skincare products and a good skincare regime. Our skin is the largest organ of the body and works 24/7 to protect our bodies from harsh weather, UV rays, pollutants, injuries, pain and a host of other unpleasant sensations, so I think setting aside a few minutes each day to care for our skin is a small price to pay. In Korea, skincare is part of the culture. Men and women, from a young age, are inculcated with the importance of caring for your skin and it is common for a Korean’s multi-step skincare regime to include 10 products! You can see the results in the Korean women’s dewy, glowing complexions! 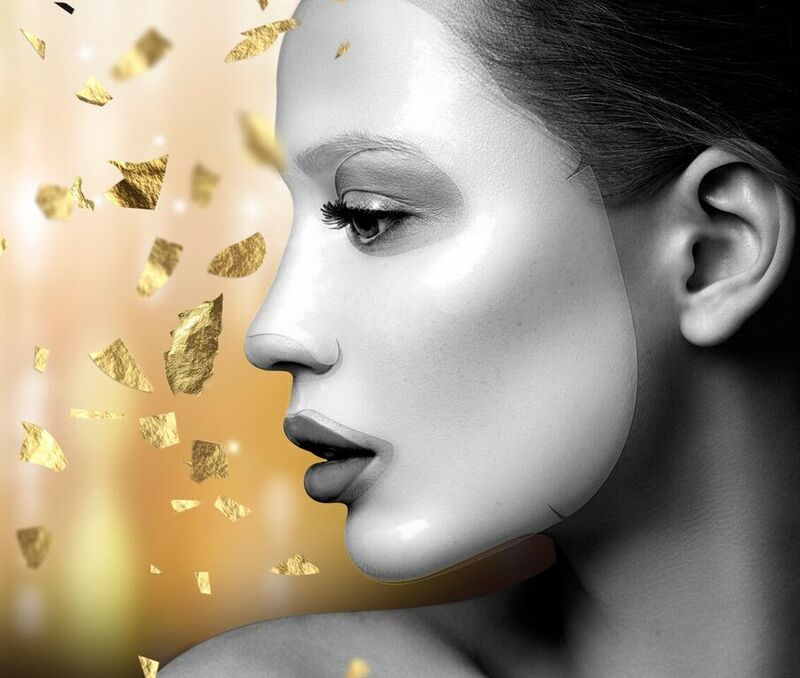 STARSKIN®’s latest range of masks, the VIP Luxury Range, was launched in the Middle East last month and comprises of The Gold Mask™ and The Diamond Mask™. The Gold Mask™ uses pure colloidal gold to diminish the appearance of fine lines, wrinkles and sun damage, while The Diamond Mask™ is infused with precious gemstone extracts and the finest botanicals to smoothen and refine dull, lackluster skin. STARSKIN® will continue to introduce new skincare innovations and high quality skincare products containing premium ingredients; in fact, STARSKIN® will be unveiling some very exciting skincare and beauty innovations in the coming months. Stay tuned!